Aircraft Aluminum Art-Nose Art Panels – Own a Piece of Aviation History! Where are You Going to Hang Your Collection? Buy Your Piece of Aviation History Now! Dimensions: 36" x 12" Shipping $28.00. This is a beautiful F/A-18 Hornet Blue Angels Nose Art Panel. Buy Yours Now While Supply Last! Dimensions: 40.5" x 24.5" Shipping $28.00. The F-16 Fighting Falcon is a two-piece panel. The insignia and markings of the F-16 are on vinyl. Own Your Piece of Aviation History Now! This panel was painted by renowned nose art specialist Gary Velasco. You Can Buy This Hand-Painted Aircraft Nose Art Panel Now. The “Big Beautiful Doll” aircraft nose art panel displays the original design painted on the last aircraft Landers flew. You Can Own This Beautiful Nose Art Panel Now! Dimensions: 25" x 26" Shipping $28.00. This Nose Art Panel shows a railroad connecting Salt Lake City to Nagasaki. It shows a winged railroad Bockscar and the symbol of an explosion over Nagasaki. Oun a Piece of Flying History and Get Yours Now! You can own a piece of aviation history with one of these Aircraft Nose Art Panels. They are hand painted by Gary Velasco a talented and experienced aircraft nose art specialist! Don't Wait Until They Are Gone Forever, Buy Yours Now! Aircraft Nose Art Panels, Honor Our Heroic Veterans That Have Sacrificed So Much For Our Freedom. This Historic Hand Painted Aircraft Nose Art Panel Can Be Yours Now! Dimensions: 28″ x 18" Shipping $28.00. This outstanding special hand-painted aviation nose art panel contains the well-known shark teeth. Add This To Your Collection Now! 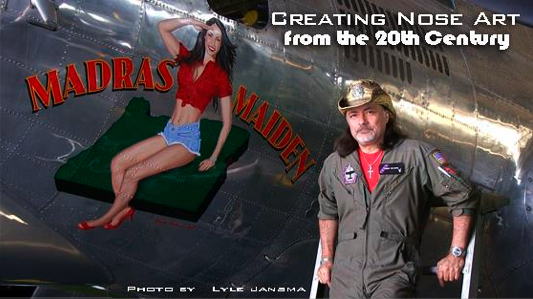 This Is a Hand Painted Aircraft Nose Art Panel And Made By Nose Art Specialist Gary Velasco! Start Your Collection Now And Own a Piece of Aviation History From World War II. Creating Nose Art From the 20th Century! I ordered several of these for my husband as a birthday present. He actually cried with joy when he saw them! They look amazing in his hanger and he’s quite proud that his buddies turned green with envy. He considers this the BEST gift I ever got him. Thanks! Wow – that is incredible! Thanks again for the rush job on this – was great working with you. I will definitely be putting in a good word for you over here (any orders originating from Balad, Iraq in the next 2 months I’ll take credit for). A perfect replica of my Grandfather’s P-40 artwork! Thanks for preserving his memory and service to our great nation.